OTTAWA, Kan., Dec. 21, 2016 /PRNewswire-USNewswire/ -- During the holiday season, festive decorations can really tie the room together. 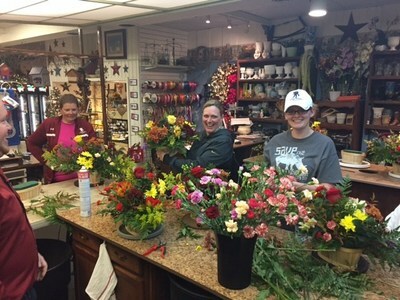 At a recent Wounded Warrior Project® (WWP) outreach event in Ottawa, Kansas, a group of injured veterans and their guests put their creative skills to the test by crafting floral holiday centerpieces. Gina Hill, whose husband is an Army veteran, came up with the idea for the gathering. She felt the small, artistic atmosphere would be a great place for warriors to connect with one another and form new friendships within their local veteran community. "We have a great flower shop in our little town, and I've always enjoyed their classes," Gina said. "It was honestly a wonderful experience to be surrounded by other warrior families as we worked on our centerpieces." With guidance from floral arrangement experts, each participant put together a unique creation to bring home to the holiday table. Gina marveled at the personal touches in all of the finished products. "It amazes me how we all followed the same directions – and still each piece turned out different," she said. "It is very much like our unique paths as part of Wounded Warrior Project. Every person might have similar backgrounds and experiences, but we all have a different story to tell." Outreach events support the long-term recovery needs of warriors by reintroducing them and their families to the unique bonds experienced during military service. Connecting with fellow warriors and local communities minimizes isolation and helps warriors continue to heal in their recovery processes. "I like to make things and get creative," said Army Reserve veteran Keara Torkelson. "I'm also a very social person; I enjoy spending time with friends and meeting new people. I am thankful that gatherings like this give me the chance to do both." Participating in creative workshops with other veterans can help injured warriors cope with stress and depression. In a WWP survey of the injured warriors it serves, more than half of survey respondents (51.7 percent) talked with fellow Operation Enduring Freedom, Operation Iraqi Freedom, or Operation New Dawn veterans to address their mental health issues. "It is not often that we get to be in an environment with people who 'get it,'" Gina said. "Wounded Warrior Project events allow us to let down our guards and truly relax. There's no judgment – we understand one another's struggles. The connections we make at outings like this can be life-saving." WWP staff interacted with attendees throughout the afternoon, advising them of additional programs and services to assist in their recoveries. The programs assist injured veterans with mental health, physical health and wellness, career and benefits counseling, and connecting with other warriors and their communities. Through the generosity of donors, these programs and resources are available to injured veterans and family members at no cost to them. "My husband and I have taken advantage of many of the programs offered through Wounded Warrior Project," Gina said. "We've built great relationships with other veterans in our area through the Peer Support program. We've discovered Crossfit® together through the Physical Health and Wellness program. This organization means a lot to us and has given us a lot of different support systems that we need." "Wounded Warrior Project has given me the tools to be a better person and manage my post-traumatic stress disorder," Keara said. "It has given me lifelong friendships – and a purpose."